Can't Buy Me Love? How To Save For An Engagement Ring! Can’t Buy Me Love? 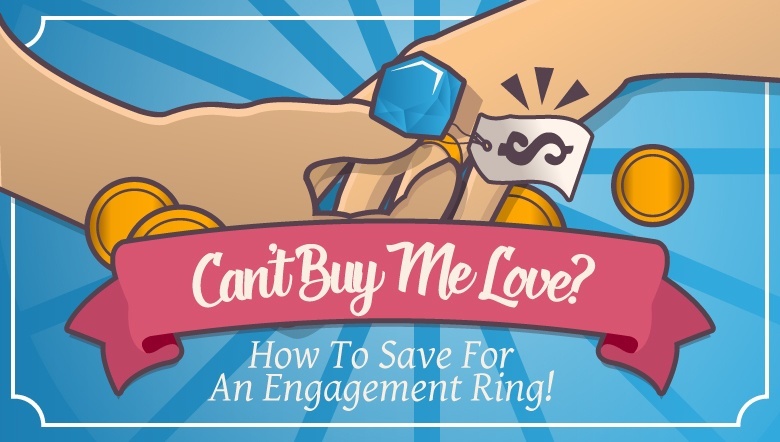 How To Save For An Engagement Ring! So you’ve decided to make the big leap and propose to that special someone. Good for you! The first thing you’re going to need to do is buy an engagement ring. But is it as easy as just popping down to the store to pick something up? If you’re anything like the soon-to-be spouses we work with, you already know that’s hardly the case. An engagement ring is a once-in-a-lifetime purchase, and you should treat it that way. Research the types and costs of diamond rings, as well as your spouse-to-be’s taste. Knowing how to save for an engagement ring and planning ahead can make the process a whole lot easier and less stressful! Did you know that the average groom spends $5,855 on an engagement ring? That’s a good chunk of change—in fact, tradition has been to spend two months’ salary on the ring. These numbers can make anyone nervous, but never fear! If you’re smart about shopping, you can save a lot. For instance, if you know that a 0.9-carat diamond looks almost identical to a one-carat diamond but costs much less on average, you’ll save money. Knowing the 4 C’s of diamonds will help you purchase a diamond within your budget rather than buying an overpriced preset ring.